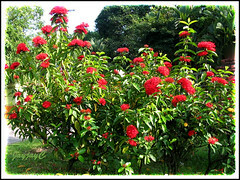 A beautiful and attractive tropical flowering shrub that blooms all year round in our country, Malaysia. 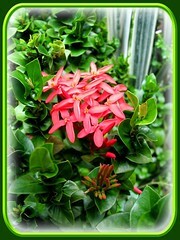 A hardy plant that comes in varying shapes, sizes and vibrant colors. It has been and continues to be an all time favorite with home gardeners and landscapers in the tropical and sub-tropical regions worldwide. 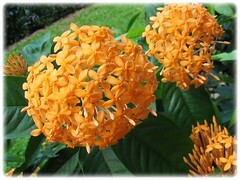 We too find Ixora charming and irresistable! 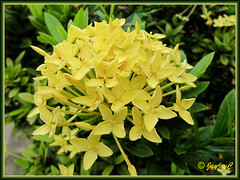 Three cultivars are grown in our garden – a yellow variety, which I’ve identified as Ixora chinensis ‘Singapore Yellow’ while researching for this article, a dwarf hybrid from Thailand, Ixora ‘Indian Rope’ with red flowers and twisted waxy leaves and the common Ixora coccinea ‘Dwarf Red’ that was recently added, as seen in the right photo. 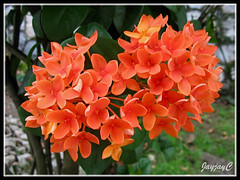 Common Name: Jungle Flame, Jungle Geranium, Flame of the Woods, Needle Flower, West Indian Jasmine, Ixora (though usually referred to Ixora coccinea). Plant type: Ornamental flowering shrub or small tree that is native to tropical Southeast Asia, including Southern India and Sri Lanka. Light: Grows best in full sun but will tolerate light shade. Prefers warm and humid climate. Moisture: Requires medium water regularly. Moderate drought tolerance. Soil: Moist, rich and well-drained soil, preferably sandy loam and acidic (pH 5.0-5.5). Poor salt tolerance. Propagation: From seed or stem cuttings (either tip or semi-hardwood), and even air-layering. For stem cuttings, take 4- to 6-inch pieces and plant in a well-drained potting soil. Then, locate at a sunny site and keep lightly watered until they become rooted in 4-6 weeks. 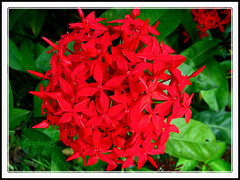 Features: Ixora is a genus of more than 400 species, with a handful cultivated as ornamental plants for their gorgeously colorful blooms. 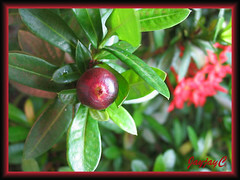 Generally, it is a low-growing evergreen perennial shrub or small tree of slow to moderate growth rate, ranging in height from 3-8 ft (1-2.5 m), with dwarf cultivars, averaging 1-3 ft (below 1 m). 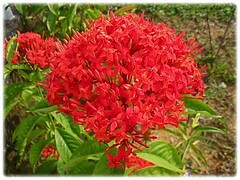 Ixora’s growth habit is multi-branched, upright, rounded and compact. The color, size and shape of leaves vary, depending on the species and cultivars. Mostly, the glossy leathery leaves are medium to dark green in color, with length ranging from 1-5 inches (2.5-13 cm), and appear either oblong, egg-shaped, elongated or more ovate with pointed or blunt tips. Leaves are short-stalked and carried in opposite pairs or whorled on the stems. 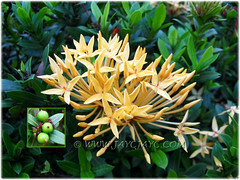 Ixora produces dense corymb-like flower clusters at branch tips almost all year long under ideal conditions in full sun. It will start flowering even when less than a foot tall. The showy 2- to 6-inch globular clusters of tiny tubular 4-petaled flowers come in a multitude of dramatic and brilliant colors, the popular range being the red, orange, yellow, pink and white of varying intensity, including scarlet, rose and salmon. It produces tiny green-coloured berries that will gradually ripen to dark reddish brown and mature into black seeds that can be used for propagation. 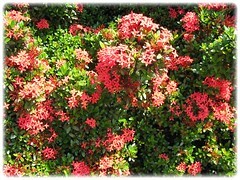 Usage: Ixora or Flame of the woods, being acceptable to hard pruning will be excellent for hedges, screens or massed in garden beds and borders for its dramatic flower clusters and colors. A prolific bloomer that will be great as a landscape plant or a specimen/accent for patio or greenhouse/conservatory. 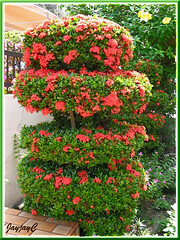 Ideal choice for container planting or above-ground planter, and used for sculpturing bonsai too. Flowers are attractive to hummingbirds, bees, butterflies and other nectar-seeking insect pollinators. (I recalled having plucked many of these tube-shaped flowers and sucked the very sweet nectar from their bases, whenever sighted as a child! :D ). 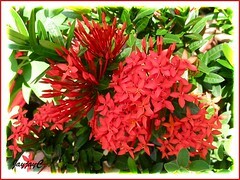 Ixora can even be used as cut flowers in vases or floral arrangement. 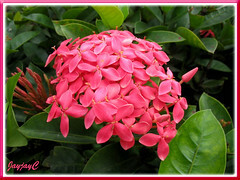 Care: Plant Ixora in moist, organic enriched and well-drained acidic soil, and where there is abundant sunlight and humidity for optimum growth and flowering. 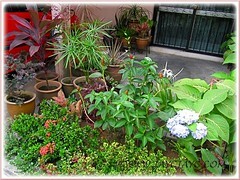 Remove flowers when withered and dried leaves if any. Prune annually to keep bush in shape or to encourage flowering, instead of repeatedly shearing off branch tips which will inhibit emerging flower buds. Feed monthly with a water-soluble fertilizer formulated for acid-loving plants. 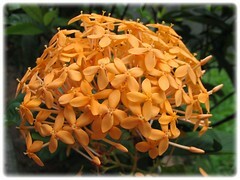 The most common pests of Ixora are nematodes, aphids, scale insects, and mealy bugs, resulting in sooty mold. 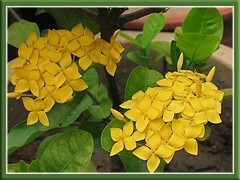 It is susceptible to yellowing of leaves (chlorosis) when grown in alkaline soil. 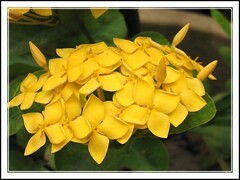 Hence, Ixora, an acid lover, should not be planted too close to concrete foundation, as it is intolerant of alkaline soil. Read more on how to control these pests and treat severe chlorosis, if affected. For temperate zones: Hardiness – USDA Zones 9-11. More information at Floridata. 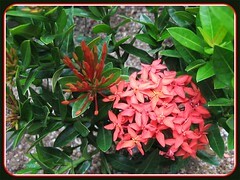 The three commonest species grown are Ixora coccinea, Ixora chinensis (Chinese Ixora) and Ixora javanica, with many popular hybrids and varieties offered in nurseries. 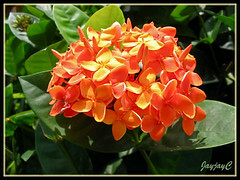 Another species is Ixora finlaysoniana which originated from India to Indochina and this shrub produces fragrant white flowers. 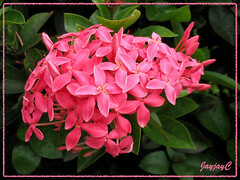 Visit TopTropicals to see photos of more species and varieties available, or Flora of Thailand (though web still under construction, it provides essential description of ixora species) and Google images for color extravaganza! I have numerous Ixora’s planted in my yard and several of them are beginning to show signs of the branches splitting and then slowly dying. I can’t seem to find an answer to this problem. I’m wondering if they are getting too much water (are watered 2x week). I have about 20 planted around my screen enclosure which does have a concrete footer. Others are planted along the front walkway opposite the footer for the house. It’s getting quite discouraging.